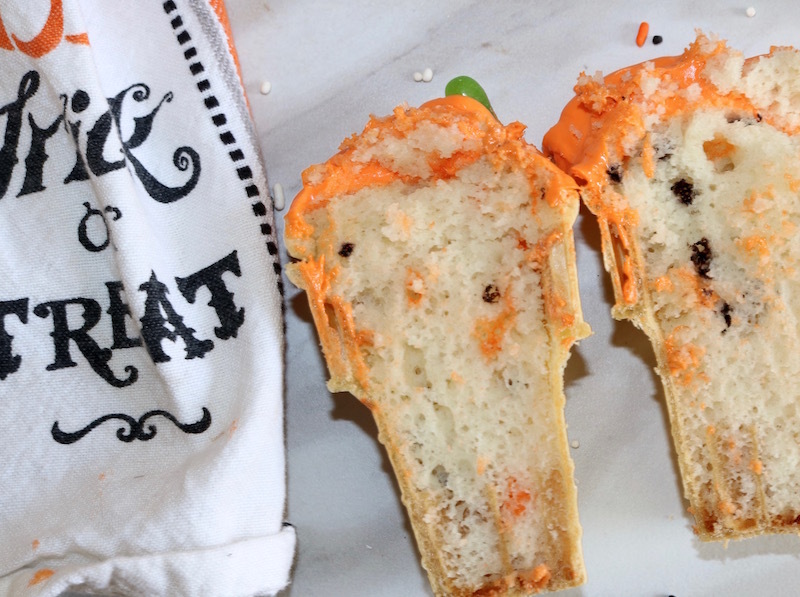 Halloween Cupcake Cones, our personal favorite! I have made cupcakes cones many times before. I must admit that these little cutie cones are adorable, and always seem to impress. 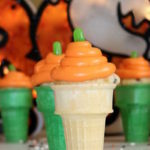 This season Brody and I thought how fun would it be to create a Pumpkin Cupcake Cone. 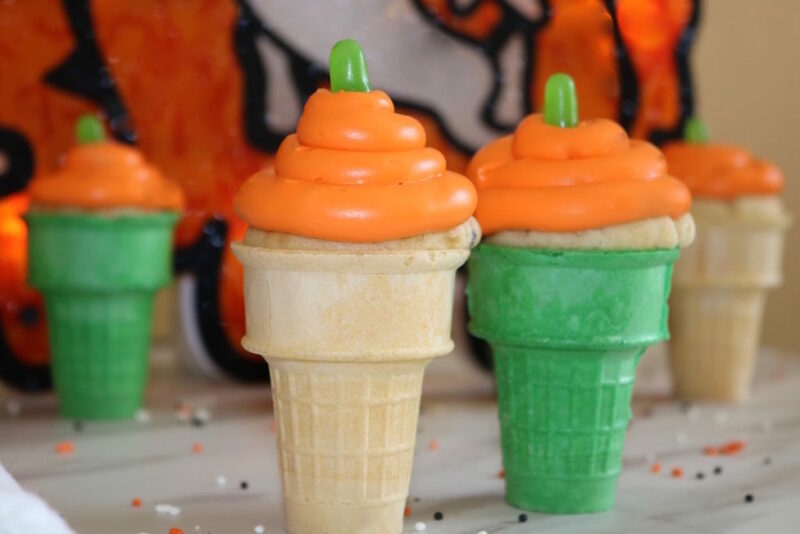 Although it does look different from a pumpkin, it worked out perfectly with the orange buttercream and the green jelly bean on top. We went for quick, and easy with this recipe. 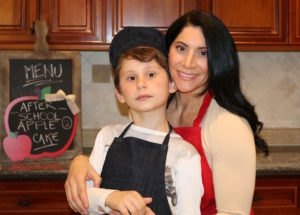 Usually we make our own batter, and buttercream. This time we wanted to spend more time perfecting the look of the pumpkin. I think we pulled it off! Although the Pumpkin Cupcake Cones are easy to make, we did have a few obstacles. Don’t fill them too high with the batter. Easier to frost if when baked it rises just at the edge. It was easy to put together, and had black and orange confetti/sprinkles in the batter. This made my boys extra excited. The cones are easy to find in the grocery store. They come in a few different colors but be careful, and check the box for breakage. Lightly shake it, and if you hear crumbs moving around try to find a box with less noise. Unfortunately, I have bought them several times and have been unable to use many of the broken cones. I also bought the buttercream frosting in orange, but it was very pale. I added a little neon orange food coloring to brighten it up. This can be easily found at the grocery store as well. Brody and I added the buttercream frosting to a piping bag, using Wilton’s 1A tip and swirled it around the top or the cone to get some height. And, put our jelly bean on top. If you don’t have a piping bag, you can use a ziplock storage bag, to frost your cupcakes. 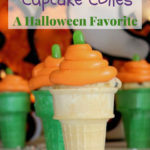 Check out our other Halloween Treat Ideas. We loved making these little cuties. They're so festive, and definitely an impressive treat. 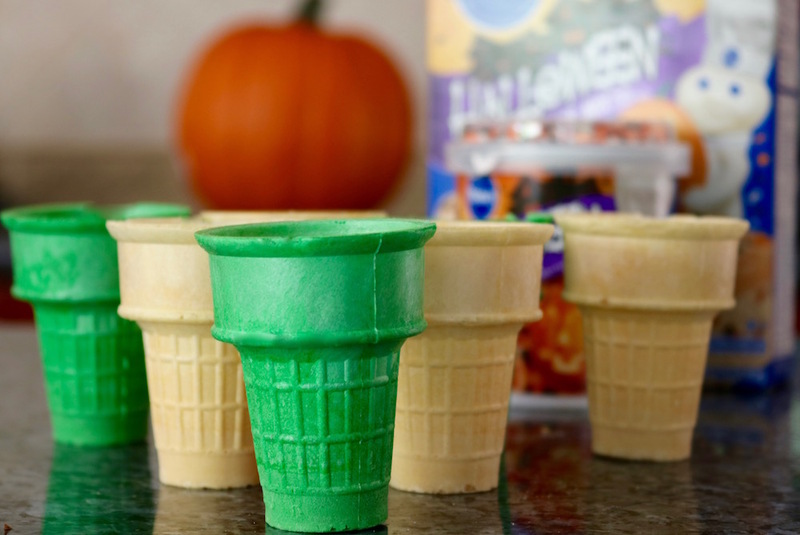 Set the cones in a cupcake pan, and fill the cones 1/2-3/4 full. Don't fill more than that. Bake per instructions. While they're baking work on the buttercream. 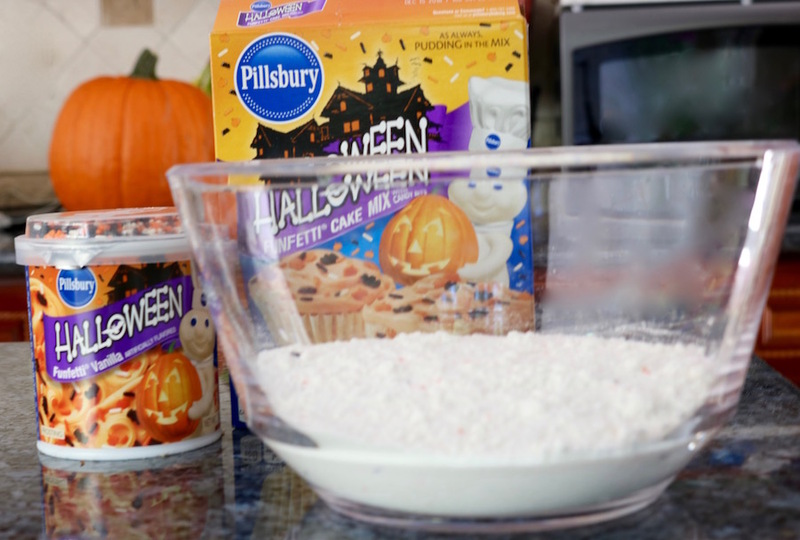 Scoop the buttercream into a large mixing bowl. Add the drops a few at a time, and mix them in. Keep adding until you reach the desired color. Set aside in a cool place. When cones are baked. Take a straight pin, and poke a few holes around the cone to release the steam. Put you tip into the piping bag, then scoop the buttercream into the piping bag, or a baggie, and cut the tip. Give the buttercream a good squeeze to get the frosting to come down the tip. Refer to instruction in blog. Swirl the frosting in a circle going around the cone, and giving the frosting height. Then add your green stem/jelly bean to the top. I love baking. I work in a school teaching children to bake and cook. This is a fun idea to work with kids. Thank you.